I just wanted to share these holiday samples! I really loved them and enjoyed making them, but didn't have time to post about them all individually. However, if you have any questions or need to know how to make them, please feel free to contact me! 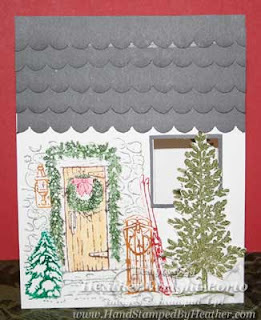 This is probably my favorite this year --- the beautiful holiday house seen, with a punched window and scalloped roof! Of course it was probably took the longest time to make (LOL). I colored the stamp with different inks, then used the Versa Mark pen to highlight certain areas, such as the trim around the door, the tree, and the sled, then added Clear Embossing powder and heated. It darkened, highlighted and glossed those areas. Then I embossed the Lovely as a Tree "tree". I punched the window with the smaller square punch and made the gray frame for the window using both punches. I also stamped the tree on the inside of the card - to show on the inside of the window! Lastly, the roof was created with several pieces of paper, punched with the Scallop Edge punch. This project was for a teen's group. The CD tin was purchased at Specialty Bottle, but all other product is Stampin' Up! 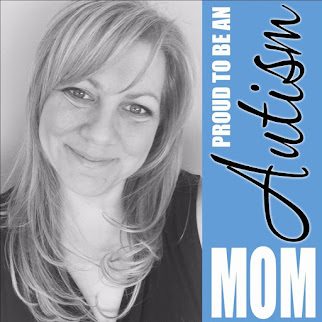 - Frosty stampset, Bashful Blue and Chocolate Chip papers, Chocolate Taffeta Ribbon, Felt Flurries, Adhesive, Stampin' Write Markers, Stampin' Dimensionals and Dazzling Diamonds! I can't remember where I purchased this Santa Face from several years ago, but I use it every year. This gift card holder is from Stampin' Up! - it comes pre-scored and punched to hold the card! 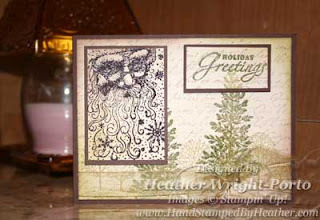 Again the Santa Face was used here with the Lovely As A Tree stampset, and the French Script background stamp. Sponging and embossing were also used! This chocolate nugget box was for another kids craft class! 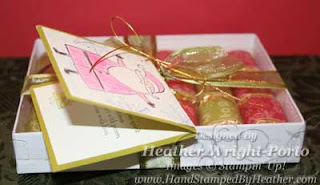 The loved wrapping each of the cholocates with Stampin' Up! 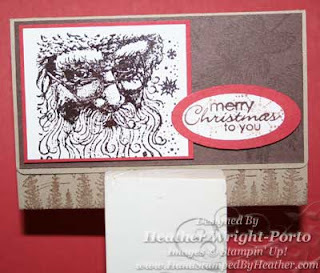 's designer series paper, and coloring the santa card. I wrapped the bow for them (LOL). Last but not least...this card is simply but elegant. 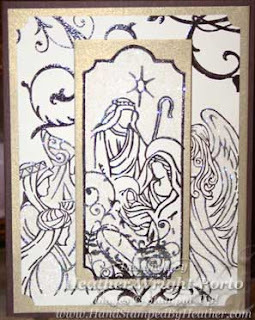 It is done in all Chocolate Chip Craft Ink and embossed. Glitter was added to many parts of the card as well. The technique "Masking" was also used on the center panel to place the baby right above the swirled bottom of the frame. Just be careful with the Craft Ink when creating this card since so much of it was used - it can bet messy (LOL). 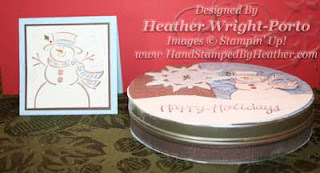 Happy stamping and I hope you enjoyed all the holiday sample left-overs!